Like stepping back in time but with all the modern amenities! 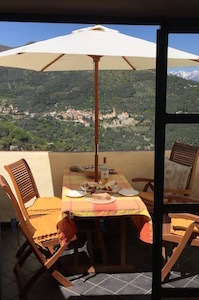 This charming stone cottage is situated in a picturesque, lively Ligurian village, offering marvelous views of the Maritime Alps and the snow-capped peaks of Piedmont. 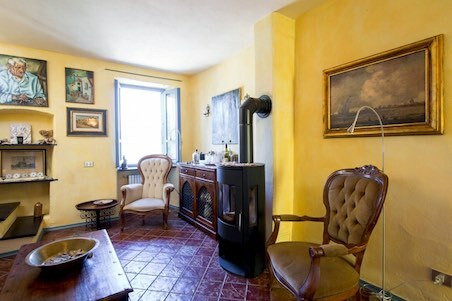 Its romantic atmosphere, its tasteful furnishings and its quiet location guarantee relaxation and recreation. On the ground floor, below the medieval archway, there is a small wine cellar with seating. A staircase leads to the entrance on the 1st floor. Here are two cozy living rooms - one with an open fireplace, the other with a wood stove - two large bedrooms, a single bedroom or office, as well as a bathroom with tub. On the 2nd floor is the bright, open kitchen with adjoining dining room, a small bath, a large terrace with stunning mountain views to the west (afternoon sun) and a sheltered terrace, ideal for breakfast, with morning sun and a barbecue. The traditional stone house is one of the oldest village houses and lies on the edge of the picturesque mountain village of Bestagno. It offes direct access with a small car for loading and unloading. Parking places can be found about 80 m away on the central church square. The medieval village of Bestagno belongs to the municipality of Pontedassio and is located 245 m above the sea level. Surrounded by evergreen olive groves and with only about 200 mostly Italian inhabitants, it offers a lot of peace and an authentic village community. Shops are located in Pontedassio, about 3 km away. The coastal town of Imperia with its beautiful beaches is only about 10 km away and the airports of Nice and Genoa about 110 km.